After celebrating its Tenth Anniversary this past September, Greubel Forsey is now reaching its teenage years with more maturity than many centennial brands. The Manufacture has been creating timepieces that are very distinguished not only in style relative to all of its competitors, but also distinguished by its standards for impeccable detail and finishing. 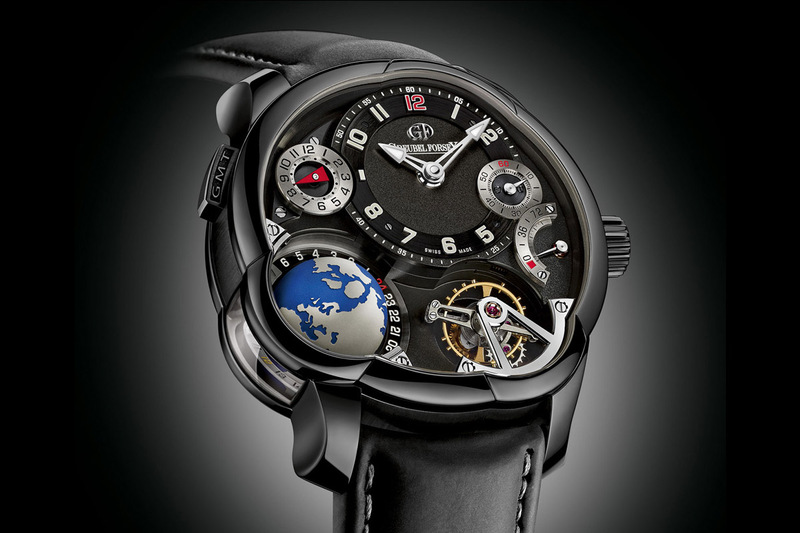 Greubel Forsey resides in a league of its own and, in this stratosphere, it marvels us with new releases and collaborates in intriguing projects with interesting outsiders. In a pre-SIHH 2015 announcement, Greubel Forsey introduced a GMT in platinum with a main plate and bridges finished in a rose tone. In contrast to this not so discreet rose-colored timepiece, They also introduced the GMT in black ADLC (amorphous diamond like carbon) titanium case. The surface treatment not only gives the case a matt black color, but the treatment also increases its tolerance against scratches. The movement and main plate also get a black surface treatment and that gives an incredible life to the dial. The three dimensional globe seems to be floating in space while the various elements of the dial are like satellites drawn by its magnetism. The tourbillon balance in a golden hue, coupled with its black polished bridge, seems like a star sun giving life to this tiny micro-universe. And in the far beyond one can read with great legibility the time. It is the back plate with it's worldtime indicator which gives a similar two dimensional representation of the storyline presented on the front. The result is mesmerizing and the timepiece presents a perfect symbolic representation of what a Worldtime is all about. Both GMTs are limited to 22 pieces. Greubel Forsey introduced the Tourbillon 24 Secondes Vision, with the intent of presenting their third invention in a slimmer case. The simplicity of the dial is superb. The silvered disc has engraved indicators which are then filled with enamel and fired. The process is called champlevé and was a technique used by high end watchmakers in the old days. It raises discreetly the markers and gives some depth to the very simple dial. The hands have been lightened and formed in the shape of a lance. Finally the tourbillon cage is still inclined at a 25 degree angle, with a tourbillon that rotates every 24 seconds. 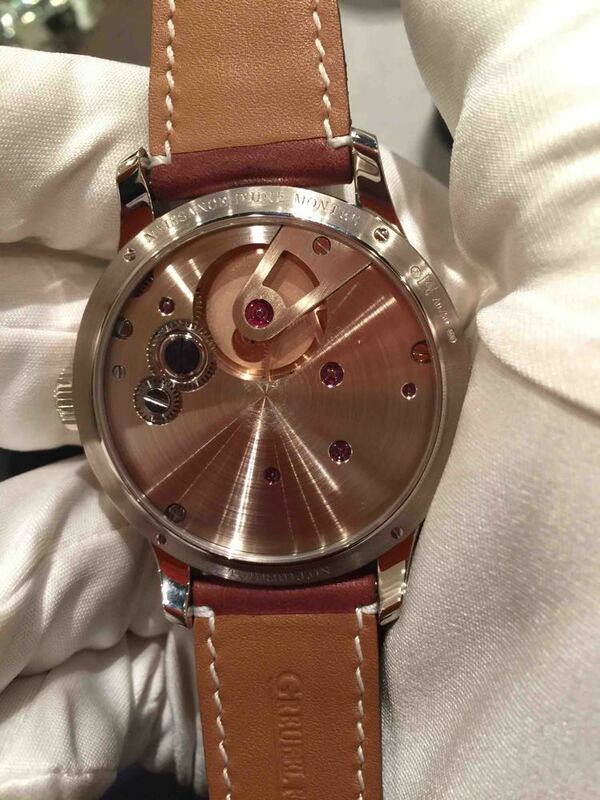 Greubel Forsey provides some space on the back and a little protrusion on the back sapphire was made, to allow for the tourbillon cage. The watch is in white gold, 43mm and will be limited to 22 pieces. Price is US$325,000. 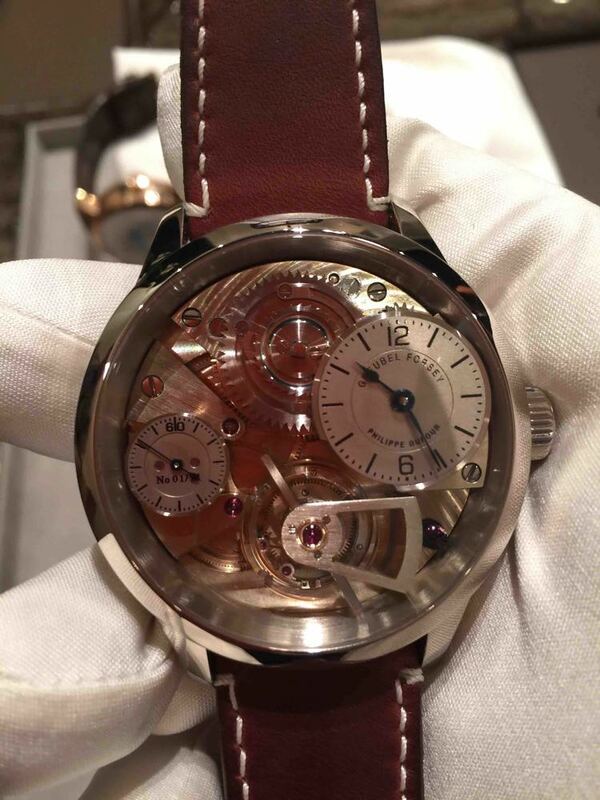 Finally, Greubel Forsey unveiled "Garde Temps- naissance d'une montre" (Time Keepers- birth of a watch), a project that was started with the Time Aeon Foundation. The Foundation was established by independent watchmakers Philippe Dufour, Vianney Halter, and Kari Voutilainen. 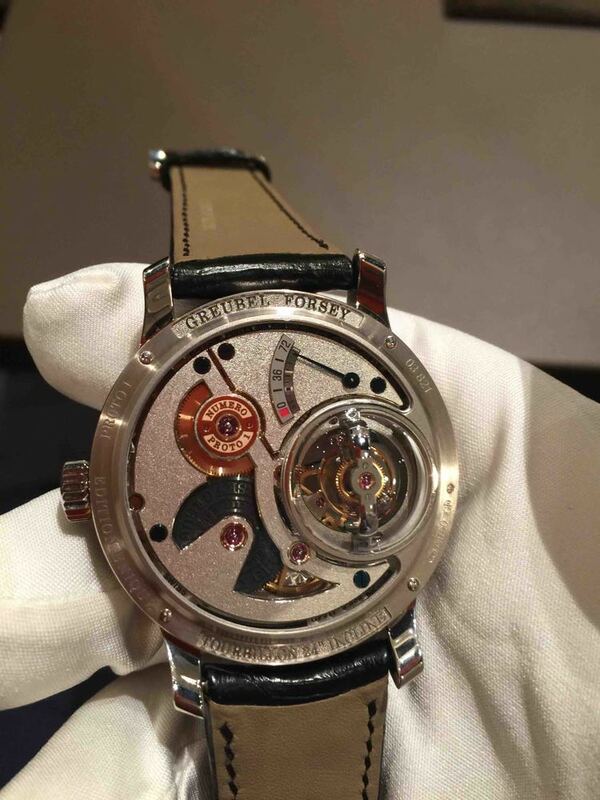 Its purpose was to help train future watchmakers seeking to become independent. They followed up a year later in 2007, with the Garde Temps naissance d'une montre project with Phillipe Dufour. All ancestral knowledge about watchmaking would be passed onto a watchmaker who should make a complicated mechanical timepiece entirely by hand. The watchmaker would then transfer these skills to young students. 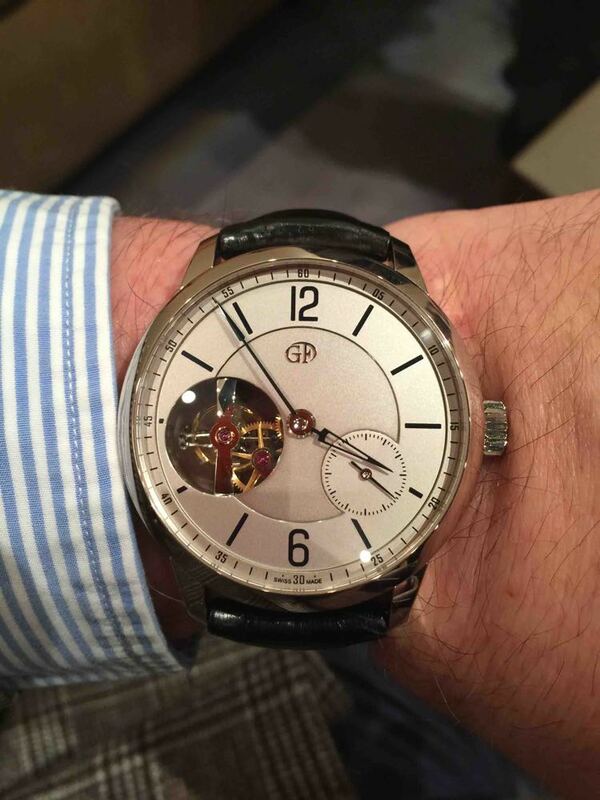 Greubel Forsey and Dufour selected Michel Boulanger, a French watchmaker, who lives in Chartres and is a watchmaking teacher. The unfinished project was presented to the public at this year's SIHH. The watch is far from being finished, and is still a prototype, but you can already see the amazing work being done. 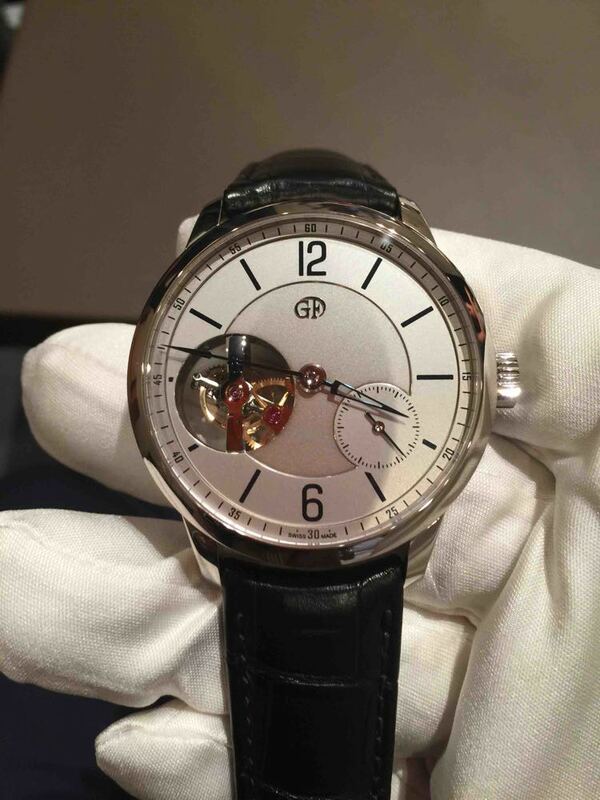 It is double signed by Greubel Forsey and Philippe Dufour. The rawness of it gives you a good understanding of the skills required to reach today's high level of finish in modern timepieces. This is done by hand meticulously with tools that are often a hundred years old. The finished watches should be completed in the next few years. Price will be around CHF 380,000. 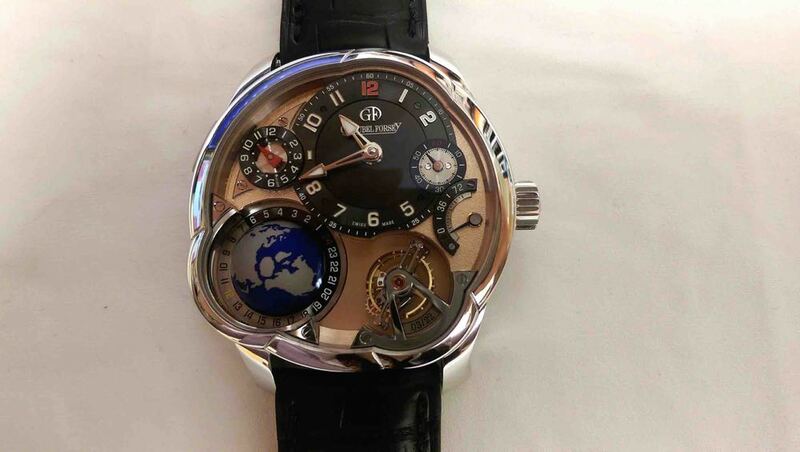 Greubel Forsey is really a world apart from anyone else; the quality of their timepieces and the dedication they demonstrate in their multiple projects are unique. Greubel Forsey is still improving the performance of their Tourbillons, they are inventing new mechanisms and also preserving the older traditions of watchmaking. All of this is being accomplished by a young manufacturer that is merely 11 years old, and the future looks even brighter.